Chevrolet dealers are offering big incentives on the Volt plug-in car. Facing stiff competition in the more crowded electric car market, General Motors is offering huge incentives to move its Chevy Volt off of dealer lots. 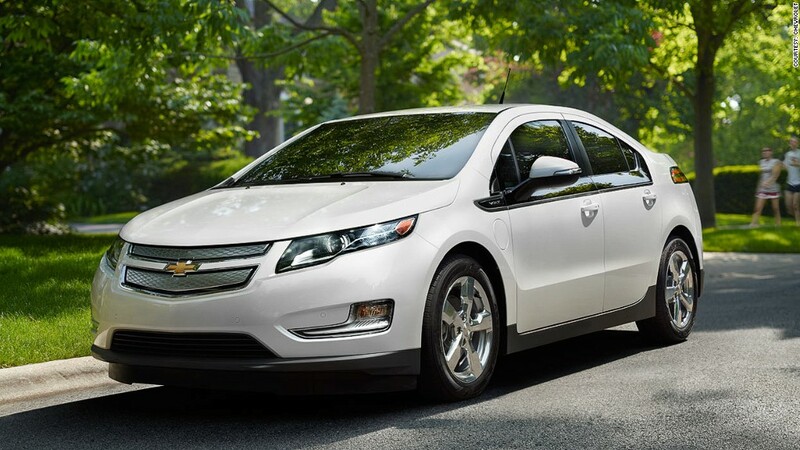 Volt buyers can get rebates of $5,000 on 2012 Volts or $4,000 on 2013 models. Alternatively, General Motors (GM) is offering a special lease deal of $269 a month for 36 months with an initial payment of $2,399 for qualified buyers, the company said Monday. While automakers don't make big profits (and often lose money) on electric cars, they are nevertheless an important part of the business. For example, California, the largest auto market in the United States, requires car makers to sell a certain number of plug-in cars if they wish to do business there. The Volt is a plug-in car that can go about 40 miles on a charge, but also has a a gasoline engine to provide power for longer drives. Besides those types of regulations, electric cars are important image makers for car companies. "A lot of these companies want to be known as the company people think of when they think of a plug-in car," said Jessica Caldwell, an analyst with the auto Web site Edmunds.com. Pricing and incentives on electric cars have been getting more aggressive recently as automakers try to improve sales of the cars. Honda recently announced a new low lease rate for its Honda Fit EV, an electric car that's available in California. The Fit EV is being offered for $259 a month with no money down. That price includes insurance, maintenance and unlimited mileage. Plus, Honda (HMC) will provide a free home charging station. Chevrolet dealers sold about 1,600 Volts last month, which is 4.3% fewer than were sold in May of 2012. Nissan (NSANF), meanwhile, saw a big increase in sales of the Leaf plug-in. Nissan sold 2,138 Leafs last month compared to just 510 the year before. Nissan is offering very low lease prices on the Leaf. The Leaf is available for $199 a month with only $1,999 down. Nissan also lowered the sticker price on the car as they moved production of the car from Japan to the United States.